The crowned heads of Europe have launched a new military campaign to reconquer the Holy Land. The time has come for you to assemble your armies and take back the land as Richard the Lionheart, or to assume the role of heir to the great Saladin and defend your people against the oncoming invasion. 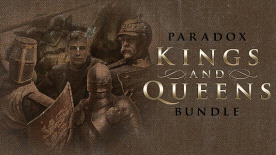 Control and upgrade the leaders and their armies and lead your men into fierce battles in this real-time strategy game that places you in the era of the Third Crusade.